I've decided I'm a joiner. I know. It's obvious. The scarf exchanges, the tote exchanges, theSecret Pal exchanges, I just have to join. So when I found out about the Elann Shawl-athon I just HAD to join. If you haven't been there before, Elann is a discount yarn site that has the most amazing free shawl patterns. I've got several of them on my "to do" list and even have the yarn for one. So when I came across the Elann-athon I just HAD to sign up. I'm so excited! I'm going to make the Pacific Waves shawl in Rose Garden. It is made with their Sonata yarn which is 100% cotton and is very colorful. I've never used cotton for anything other than small dishcloths so this will be a new experience for me. Also it is a very easy shawl pattern for when I don't want the complexity of the Victorian Lace pattern. The kick-off is on May Day but I told myself I have to get several things off the needles before I can put anything back on. So far 2 off and 2 to go. I think I'll be able to start this in about a week. I'll post progress as soon as there is any! I have 10 balls of the Sonata in a pretty purple color at home. I think I also have brown. Ohhh, you enable others too!! I am lusting over the kit you sent - I can't decide on the triangular shawl that came in the kit - or the rectangular patterns you sent. Do you have a picture of the one you made?? 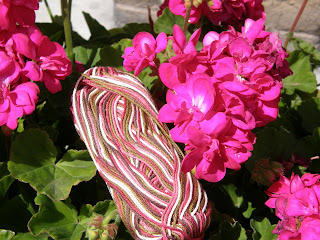 If you had another to do, which would you do - using the yarn you sent to me?? So many choices - it's hard to decide!! Joining is a good thing!!!! It's amazing all the opportunities that are available!! The shawl is going to be beautiful. I love the colors! It is a beautiful shawl, but that cast on 541 stitches is a big deterrent for me. Can't wait to see yours though.